Yesterday, the first day of spring, I had an unusual conversation with a robin. I could tell right away this was no ordinary robin. 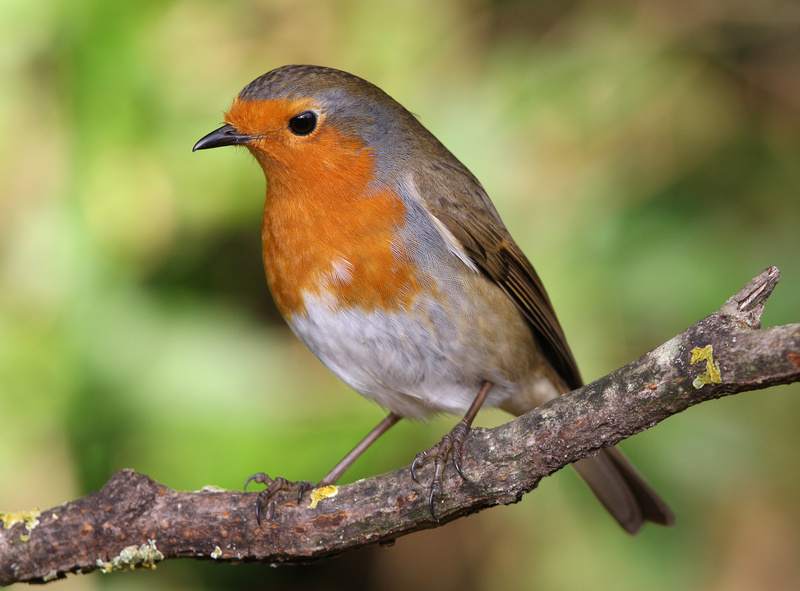 It’s extraordinary for a robin to stop and give you the time of day, much less have a conversation with you in the middle of the day. A robin has to really be distracted to want to talk to you. And she was. She was in a tree, and that was ordinary. She occasionally fluttered her wings during our talk (as if testing that they still worked) and that was ordinary. She hopped about on the branch, as if itching to go somewhere, and that was ordinary. But she had two tiny suitcases, crammed and overflowing, on either side of her. And so I knew: This was no ordinary robin. She was struggling with all her bags and not making a bit of progress, and I could tell she could use a friend. “What is all this stuff?” I asked. “I’m not like the other birds,” she explained. “I didn’t leave my nest when I was a kid. No ma’am, I stayed right there. I wanted to be ready.” She bobbed her head at the nest just beside her. “That’s a lot of stuff,” I commented. “My parachute,” she said with a little exasperation. “How can anyone fly without a parachute? And my snacks. Don’t want to faint of low blood sugar in the middle of flight. And my winter downy jacket in case it gets too cold, and my suntan lotion in case I fly too close to the sun. “My photographs of my mom and dad, brothers and sisters, and my great-great-great aunt. The string my mom found in the parking lot last month and the straw my brother brought in from that old barn by caterpillar pond. I’ve got to bring those with me. Don’t want anyone stealing my valuables. And . .” she wiggled her foot. There was a string tied around her foot. Now that I noticed it, I saw the other side was tied with a neat bow around her nest, too. She looked indignant, and robins have a very serious indignant look. “What do you mean?” she asked. “I’ll have it with me. That’s all that matters. “But you can’t put it on mid-air,” I said gently. “–You’ll have to excuse me, but I need a nap after all this thought of travel,” she interrupted. “Not to mention, these suitcases are heavy. I think I pulled a feather. “Now, if you see any worms, send them my way. Oh, and those little packages of travel peanuts. “If you see my insurance agent wandering around, would you bring her here? I think she made a right after the oak instead of a left . . With as close as I got this year to travel, you had better believe I need more flight insurance.” She shuddered. “I probably shouldn’t have even gone out on a limb without it. It’s difficult enough to have a teenager in your home, much less a new teenager in your home. But let’s suppose that you have decide to adopt a 15-year-old teenage boy. We’ll call him Clay. You’ve never met him but tomorrow you are going to bring him in your home with the full and unconditional intent to adopt him if he is willing to be your son. You’ve been informed by Social Services that Clay has been bounced from house to house all his life and hates all authority except that of his biological father, who just got out of prison and wants Clay back. Clay’s coming to you not from a foster home but from the juvenile ward, because no foster family has been willing to take him for over a year. And for good reason. He was originally removed from his home for abuse and neglect. Since then, he’s built a reputation for malicious behavior towards peers and foster parents alike. He distrusts everyone and has a track record of running away. He’s been in juvenile detention and psych wards several times for outbursts of violence, refusal to follow authority, and destruction of property. He’s killed pets and even had episodes of injuring other children in the homes he was in. Clay comes to your home and you welcome him with open arms. You show him to his new room. You’ve filled his closet with clothes. You let him discover the stereo, guitar and sports stuff you bought him. You give him a cell phone so he can call you whenever he wants. You bring him to the kitchen and show him a pantry and fridge stocked with snacks, and let him know you will make him breakfast, lunch, and dinner and he will sit as one of the family at the table. That night at dinner, you tell him about the vacation the family’s been planning for several years that you’re finally taking next week, and how of course he is going with you. The next day, you sit him down and tell him about the ground rules for your house. You make your expectations clear to him. He openly sneers at you. You tell him how serious you are about these rules, but he responds by shrugging his shoulders and looking away. The next day, you bring him to the private high school you enrolled him in with a new backpack, folders, mechanical pencils, and notebooks. You introduce him to his teachers and he’s sardonic and rude. You take a tour of the school and offer to take him to band or football practice or any other extracurricular activity available at the school. He asks confrontationally if you’ll take him to a casino. You leave him at school with the lunch you packed and go to work. 1 hour and 10 minutes later, you get a call from the vice-principal. Clay has been suspended for throwing a book across the room and hitting a classmate in the head. This is the beginning of a long, long year. When you take him on your family vacation, he tries his best to make it miserable for everyone. He constantly complains, won’t listen to any directions, and you have to physically keep your hand on his arm to keep him from walking away from you at the theme park. He constantly gets in trouble at school, and you often have to leave work to bring him over with you. You have to sit him beside you at the desk at your office, do your work, and watch him like a hawk to get him to complete any schoolwork whatsoever. Four times he’s run away from your house trying to go back to his father, brought back each time by a police officer who recommends you send him to either a psych or a juvenile ward. You have to keep your wallet in your dresser at night or he steals money out of it. You have to check his pockets, backpack, and room all the time for things like knives, cigarettes, condoms, and drugs. Four times he’s spent a few days in juvenile detention. If you hadn’t made right on all the damages he’s caused, he’d be spending the rest of his “under age” years in detention. He’s spit in your face, killed a neighborhood cat, kicked in cabinets, broken his stereo and guitar, busted the window out of his bedroom more times than you can count, and one day you came home to find he’d left school without permission to deface your house. If this is not bad enough, you find out that a girl from his school who is pregnant is claiming the child belongs to him. When you confront him he says he doesn’t know if the child’s his or not. He says he is absolutely not going to take a DNA test and, regardless of how you explain that he may not legally have a choice, he says he’ll never be a part of the child’s life or pay child support. To add insult to injury, Clay uses the cell phone you got him to text his friends he had before he came to your house, saying stuff about how much you hate him and how you’re always making the stupidest rules for his life, trying to mess with him, and choking his freedom. He rants about how you force him to do schoolwork, never let him out of your sight, search his backpack and room, won’t give him any money, and won’t even teach him how to drive. He even lies about you and says that you lock him in the closet and go days without letting him have food. Even worse, he found his biological father’s phone number and calls him nearly every night. If you prevent him from calling, he hates you. And if you leave him to call, his father builds an even deeper hate for you than he already had. If you keep him in your sight, he hates you, and if you let him out of your sight, he runs away and inevitably winds up back in juvenile hall. All the time, his father stirs him up against you, rendezvousing to give him money, drugs, and alcohol. His father slanders your name every chance he gets and provokes his son to break away from you the moment he turns 18. You know from reading his foster care records that his biological father was the one who beat him and locked him in a closet–but the charges never stuck. He has a reputation as a drug dealer and even had murder charges against him that were dropped on lack of evidence. Every so often, he calls to taunt you that you will never change his child and he brags that Clay will come running back to him as soon as he turns 18. He even shares with you the plans he has to destroy his son’s life. When Clay’s court date came up for your pending adoption of him, he told the judge he would rather die than be adopted by you. He asked to return to go back to his father’s custody, but the judge denied it. Though Clay still lives in your house, it looks as if he won’t for long. He has an app on his phone that counts down the days until he can legally leave your house–for good. Every day, you sit Clay down and explain to him that, once he turns 18, you will no longer be able to protect him from the consequences of his actions. You warn him about his father. He accuses you of hating him and retorts that when he turns 18 you’ll never see his face again. So what happens to Clay? Clay, of course, is you and I. He is in conflict between two worlds: the world of his biological father and the world of the father or mother who wants to adopt him. We are in conflict between two worlds, too: the world of the father of the fallen world, Satan, and the world of the Father who created us and seeks to adopt us back, God. Have you ever heard anyone throw the excuse out there that the reason they don’t follow God is because they don’t like His rules? But Clay isn’t rebellious against his adoptive parent only because of new rules or expectations. He’s rebellious because he doesn’t love the new parent. He loves the old parent. The heart of our rebellion against God isn’t because we don’t like His rules. It’s because we don’t loveHim. We have been raised in a world of sin, and we are comfortable with the father of this world, Satan. We want to do what he says and we want to live with him. Our hearts long to do his will and seek his approval. We see the compassion and faithfulness of His love most of all in that He sent His true Son to die for the false sons of Satan. This is something so outrageously loving I couldn’t even write a parallel for it in the story about Clay. No one, no one here on earth would take their dearly-loved, obedient, faithful child and send that child to die in the place of a wicked-hearted, mocking, sin-spitting foster child’s sin. We must look to the Heaven to find the only One who would be willing to bear this unimaginable sacrifice, and that is God Himself. Only God would do this. The truth is, I couldn’t describe Clay horrible enough to really get at what our sin looks like in the eyes of God. God sees us in light of eternity, not in light of only the present moment. He sees the everlasting ramifications of our sins. Our sins cannot be paid for by money, community service, or even prison sentences. Our sins are not even paid for by eternity in Hell. We can’t pay for our sins because we can’t remove them from the sequence of time. All sin has the power to snowball on forever and ever, creating more and more havoc as it goes. I need look only at what Adam’s sin caused to see this devastating reality. Even though God is willing to adopt us because of His great love, and able to adopt us because He has paid for every drop of our deceit and desperate wickedness, we still resist Him because we are deceived. Like Clay, who believes his father really loves him or at least has something to offer him, we are deceived by Satan. God’s Word gives clear vision to the true nature of Satan. We have natures that oppose God, and submitting to Him would be eternally breaking alliance with our father, Satan, and renouncing his hold over our life. We think we enjoy the “freedom” Satan’s way “gives” of doing whatever we would like. We are like the people in the time of the Judges, when they were described in this way. Clay will one day turn 18 and at that point, he will either have already agreed to be adopted into the permanent household of the parent who loves him, or he will no longer be able to belong to that parent. He will go back to his old father. In a way, this is like what happens when we die. At that point, we will have either already have been adopted into God’s house, or we will be forever with the father we have chosen and we will face the consequences of that alignment. Jesus warns that those who align themselves with Satan will go where he goes. Depart from me, you who are cursed, into the eternal fire prepared for the devil and his angels. Like Clay, though, the ending of our story is still unknown. Clay is not yet 18; you and I are not yet dead. Clay can blindly live his time up to his birthday as he has always lived, or he can at last see with open eyes the once-in-a-lifetime chance he has been given. The details of what Clay has done is really irrelevant to the choice at hand. The story would be the same whether he visited juvenile detention only once or a thousand times, whether he ran away only once or a thousand times. The plot of the story is not carried by what he has done, but by what his adoptive parent is offering. Therefore, whatever he has done to prove he does not belong to the adoptive parent, it can all be undone by the single act of adoption. The act of adoption is not in Clay’s power to give. He can’t adopt himself, of course, and he can’t force anyone to adopt him. The glory is that Clay does not have to worry about whether or not he will be adopted. The offer was freely and unconditionally given and stands until he turns 18. In the same way, you and I can choose to accept God’s paid-in-full rescue of us from our sin and be His children forever. So now there is no condemnation for those who belong to Christ Jesus. And because you belong to him, the power of the life-giving Spirit has freed you from the power of sin that leads to death. The law of Moses was unable to save us because of the weakness of our sinful nature. So God did what the law could not do. He sent his own Son in a body like the bodies we sinners have. And in that body God declared an end to sin’s control over us by giving his Son as a sacrifice for our sins. He did this so that the just requirement of the law would be fully satisfied for us, who no longer follow our sinful nature but instead follow the Spirit. But you are not controlled by your sinful nature. You are controlled by the Spirit if you have the Spirit of God living in you. (And remember that those who do not have the Spirit of Christ living in them do not belong to him at all.) And Christ lives within you, so even though your body will die because of sin, the Spirit gives you life because you have been made right with God. The Spirit of God, who raised Jesus from the dead, lives in you. And just as God raised Christ Jesus from the dead, he will give life to your mortal bodies by this same Spirit living within you. This adoption is not one of artificiality. It is a real adoption. Just as Clay will begin to follow his adopting parent’s rules and become a part of the household as he is genuinely adopted, we will begin to follow Christ and become a part of His household as we are. The word “suffering” is not appealing. Adoption into God’s household is not equal to an easy life. We are expected to obey Him, conform to Him, and allow Him to mold us into the people He wants us to be. We are to stand up for Him, endure any attacks we might receive because we belong to Him, and follow Him as our final authority, just as a genuinely adopted child should in his new household. We are to follow Jesus with all our hearts, but this does not mean God will not give us grace when we fail. John writes about this hope in one of his letters. If Clay suddenly realized the love that was offered him, and if he turned and ran into the arms of his new parent, sobbing and begging forgiveness, do you think he would never again fail? I think we know teenagers better than that. Adoption is not contingent on works. God does not accept us because of things we will do for Him once we are saved. If that were the case, why would He offer us to become His children while we are still unworthy? And if we could become worthy, why would He have sent Christ to pay our debt in full? Don’t let anyone capture you with empty philosophies and high-sounding nonsense that come from human thinking and from the spiritual powers of this world, rather than from Christ. For in Christ lives all the fullness of God in a human body. So you also are complete through your union with Christ, who is the head over every ruler and authority. When you came to Christ, you were “circumcised,” but not by a physical procedure. Christ performed a spiritual circumcision—the cutting away of your sinful nature. For you were buried with Christ when you were baptized. And with him you were raised to new life because you trusted the mighty power of God, who raised Christ from the dead. The relationship between a parent and a child is a working relationship. The parent gives the child wisdom, direction, and remedial help. The child soaks in the wisdom, follows the direction, and learns from mistakes through the remedial help. This is the working relationship between a parent and a child. You struggle against sin, but your struggles haven’t killed you. You have forgotten the encouraging words that God speaks to you as his children: “My child, pay attention when the Lord disciplines you. Don’t give up when he corrects you. Clay won’t be “done” with the problems in his life if he allows the adoptive parent to adopt him. If he begins to listen to the parent, he has to face the problems he neglected to face. The issues of drug addiction, vandalism, and child support could be ongoing. Clay will belong to his adoptive parent, and this is when the real work of his life will begin, not end! This isn’t because he is “paying” for what he has done, but because he will be for the first time developing the character befitting a child of the adopting parent. In a little bit of the same way as Clay would to his adopting parent, when we come to God to become His child, we yield to His will, knowing that He will develop within us the character befitting of a child of God. Now, we cannot reach this without grace and forgiveness, and we will never “arrive” at this character in this life. But He will keep bringing us closer to the character He wants us to become, so that we may enter Heaven without shame or fear or uncertainty. And God has given us his Spirit as proof that we live in him and he in us. Furthermore, we have seen with our own eyes and now testify that the Father sent his Son to be the Savior of the world. All who confess that Jesus is the Son of God have God living in them, and they live in God. We know how much God loves us, and we have put our trust in his love. When we become a child of God, the real work of our life begins! Clay’s adoptive parent doesn’t force Clay’s adoption, and God doesn’t force you to be adopted by Him. Though we have no ability to deserve the gift given, we do have the choice to receive it or reject it. The choice is really the difference between eternal life and eternal death. As Moses testified in the Old Testament, so Jesus testifies in the New Testament, to each of us. Every one of us could be His child, if we would go before the Judge and accept, in sight of the world, our adoption into the family of God, made possible through the blood of Jesus Christ. There’s something I’ve noticed about kindergarten drawings. They are so primitive you can scarcely ever tell what they are supposed to be drawing, but if you watch them as they draw, you know why they are drawing it. The feeling is almost their only focus. They bother very little with details, because they assume everybody already knows the object, and they want to focus on how they feel about the object. However, kindergarteners are not usually one bit offended if you have no idea what they drew. They don’t see this as failure on their part, but rather pity you for being such an ignorant soul. They will happily tell you what they drew. The love they have for their picture can’t be easily undermined, because the picture represents the actual object that brings them joy. Coming to faith in Jesus and then trying to explain it to others is like a kindergartener being taken up on a rocket ship to the moon and then trying to explain the experience to skeptics who don’t believe the moon exists. The thrilled and very hyper babble would be dismissed as exaggerated, immature, incoherent. New believers are like kindergarten artists. The feeling of forgiveness is so powerful, happens so fast and is so exhilarating, their hand is shaking as they try painting their experience for others to see. The way they live out their new faith can be sloppy and very inconsistent. But the happiness they feel about their conversion is so huge, they almost don’t care what people say about them! They just want everyone to experience the love of Christ for themselves. These new converts can look like they’re based in emotion and can seem ignorant. They can’t usually explain much of what they believe, and they appeal to feelings to try to get others to understand. They want to sing loud rock songs to God and they want to dance and mountain climb for Him. But there’s nothing bad about this. The world rips Christianity apart for these kind of believers, but any teacher worth her salt wouldn’t rip a kindergartener apart for drawing a purple blob with a smiley face and ears and calling it a panda bear. Just like artists, mathematicians, and chefs have to start somewhere, so do new Christians! There’s nothing bad about this stage. But we don’t want to stay in kindergarten forever. We want to move on, without forgetting what we learned in kindergarten. I woke up from a dream about Frishy this morning, and I was astonished to realize I have never written about him. I checked back in my posts to be sure. Sure enough, not one word has ever been said here about Frishy. I don’t think I have any pictures of Frishy. We had the click-and-develop-two-months-later kind of cameras when I was growing up, and you just didn’t take pictures of aquariums. But I found a picture of the kind of frog Frishy was, and he looked strikingly similar to this one, except he was a silver green. Frishy did not look the same as a regular frog. That’s where Frishy’s name came in: Frog + Fishy. Frishy’s scientific classification is the African Clawed Frog. I never knew that. I always thought he was just an African Frog (AF). He did, come to think of it, have claws on his back webbed feet, but he never used them. I reached in his aquarium cage (AF’s must have a lid on their aquarium) and petted him on different occasions. He never had the least desire to scratch me. As Wikipedia says, the AF is toothless and tongueless. I never thought about the tongueless part, but it’s true. They are, however, very agile with their hands. I used to watch Frishy eat his Tetra mix pellets by holding them in between his dainty little hands. I learned, just today, that the average life span of an AF is 5-15 years. 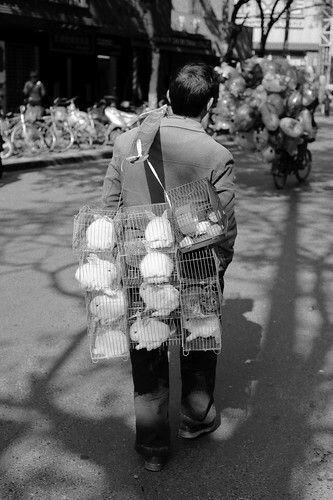 From the pet shop company Frishy was ordered, the life expectancy was stated to be only 1 year. I would imagine, knowing what I know now from Wikipedia, the sole reason for this is care. I had one friend who had an AF tell me she’d run out of pet food, with a rather forlorn look. “Get more food,” I said. She said didn’t know what kind of food AF’s ate once the mix, sent with the tadpole, ran out. I told her what it was, where to buy it, and ordered her, over and over, to get her parents to take her to the pet shop that day. Her frog had not eaten in two days. I never recommend for people to get an African frog. In fact, I hope they don’t. I grieve to think of them starved to death or flushed down a toilet when they’re of no interest to their owner anymore. When Frishy died, he was buried in my yard with the conch shell he had so loved as a marker. I couldn’t stand the thought of my little pet going down the toilet like useless waste. Frogs in general are treated pretty bad in our society. People see frogs as “pests”. I see “pests” as animals. That’s the difference, I guess. I don’t look at a frog and see something that needs to be destroyed. I look at a frog and see something that, like everything else here, has been damaged since the fall. And it wasn’t even the frog’s fault. It was our fault, for opening the world to Satan’s sin. But somehow, we forget all about that and hate frogs. Her story reminds me of why I cared so much about Frishy and his buddies. It reminds me why I still dream about protecting him from bad things. It’s the story of helplessness, utter vulnerability, daring rescue, and deep care. Frishy made a deep imprint on my life because this was his story, but I didn’t know he was teaching me about something far beyond, far above, and long before he came to me as a tadpole. The Bible shares an extraordinary story with us. It has helpless, utterly vulnerable creatures in it, a daring rescue, and deep care. The helpless, utterly vulnerable creatures aren’t African Frogs, though. Although they are pests, and they are unwanted, and there is someone who wants to flush them all down the toilet, they are not frogs of any kind. The helpless, utterly vulnerable creatures are . . us. In comes the daring rescue. God has no intention of letting Satan leave us in a tank somewhere to starve to death or flush us down the toilet. God could, rightfully, wave His hand at us in disgust, walk away from us, and pay attention only to the creatures He made who didn’t choose ugly monstrosity and great frailty for themselves, like the angels. But God didn’t walk away from the aquarium that sin has trapped us in and leave us to Satan as our caretaker (the caretaker we thought we wanted). The little bit of compassion I felt for Frishy and desire to rescue him gives me a way to relate to God’s compassion and rescue for us. If God didn’t give us experiences where we could feel compassion and the desire to rescue, I don’t know how we would ever relate to His compassion and rescue of us. Of course, I recognize that my kindness to Frishy, compared to the kindness of God, is so itty-bitty it couldn’t even be seen under a microscope. But it’s a way God chose to show me a glimpse of how it feels to be Him. God is so good that He pities us and He cares for us, even though, in our fallen state, we’re nothing more than pests. This is the very thing about God I had the hardest time believing. Now I see that, all those years of doubt and fear I had that God could ever be kind to me, God kept showing me a glimpse of His love in a way that I could understand–a way that might seem stupid or unimportant to others, but was very meaningful to my heart–through little Frishy. Thank You, Jesus, for Frishy. Thank you that you speak to our hearts in ways so humble that scoffers mock, but You do it anyway because You care more about our rescue than what others say about You. You love me, even though I’m an undesirable, flushable, totally needy pest. Even though I have nothing to give You, even though I am utterly worthless to You, You pour Your value in me through Your love of me. Unlike Frishy, I am no pet to You. You keep me as Your child, and You tell me that, one day, I will no longer look like a worthless pest, but instead be metamorphosed to the priceless daughter You are already changing me to be on the inside. 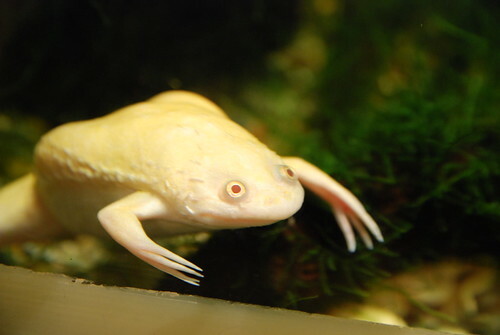 “African Clawed Frog”, Wikipedia article, used as a source: http://en.wikipedia.org/wiki/African_clawed_frog, accessed 4-28-2012. See Copyright Page for other Bible translation information. I remember the first time I saw “guess what it is” photos. My mom got an issue of a magazine chock full of games, and one of them was photos of objects super close up. Some of them seemed almost impossible to guess. Even common things we see often or know well can be incredibly hard to guess at an unusual angle and zoomed in vantage point. I can’t imagine what the world would look like through a dark glass. Even the most ordinary object would be obscured and be strangely unrecognizable. Yet this is the way we live right now. The way we see God, ourselves, and everything around us, is like looking through a dark glass. Our perceptions on right and wrong, values, dreams, achievements, fulfillment—all are skewed and darkened by the fallen state we live. We might think we see clearly, but that’s only because we have ever always known what it is to see through a dark glass. We don’t have the eyesight of Adam and Eve, who, when they were created in their sinless state, saw only good. Our eyes are darkened with the horrors of the sin we have growing inside us, from the moment we are brought into this world. I have to be really, really careful when I make value statements, judge between right and wrong, or give advice. If it’s only from me, then I’m reporting through a glass darkly—and it’s pretty hopeless. Every Christian in history has, at times, reported things through a glass darkly. Augustine? Yes. Martin Luther? Yes. John Wesley? Yes. Billy Graham? Yes. And on and on and on. In fact, haters of Christianity love to point out inconsistencies and mistakes Christians have made. If every Christian, confined to this life, will see through a glass darkly, what hope do we have that we can ever illuminate Truth to the world? Jesus called us to be the light of the world–but how can we be a light if our own vision is fogged with the mess of sin? The difference is who we are and what we know. We are God’s light, purified by the blood of Christ Jesus, all our sins forgiven. But what we know is limited not just by our mortality, but much more so by our sin nature. In the sin nature comes a natural conforming to society. That’s really unfortunate, because society is rarely focused on Christ. We are not called to simply dwell in God’s righteousness, we are called to share the Good News of Jesus Christ. But how can we, when we are, in this body, tainted by our sin? This is like asking, “Even if we are light, how can we be light?” Light is light. It does not have to seek to illuminate; it does. By its nature, light reveals what would otherwise be hidden in the darkness. We are given a new nature, a nature that does battle with our sin nature. The new nature is gifted us by Christ. It is God’s Spirit within us. But . . how do I know when I am listening to the Spirit and not my sin nature? There is a way. And it isn’t seeing through a glass darkly. It is through seeing clearly. It doesn’t come through physical sight, or the sight of our own blind reasoning, but instead through the sight of a soul freed by Christ Jesus. This sight is a gift of Christ to the believer, and is given through reading God’s Word. Many lost people have read God’s Word and stayed lost. Why? Because the Word of God is not hypnotic or deterministic over our freedom to choose. The Bible says that Jesus is the Word, and we know that not everyone listened to Jesus. In fact, most people rejected Him. In the same way, reading the Bible isn’t equal with understanding its meaning, its reality. For that to happen, we must be able to see God’s Word. And we can’t see unless God gives us “soul vision”. It sounds complex, like a long chain of events must be in place before we can see rightly. But, in actuality, the entire ability hinges on the gift of Christ. That’s a gift given freely to anyone who asks. If you truly want to find God, if you truly want to see clearly, God will make Himself known to you and give you sight. That’s a big claim, but I didn’t make it. God did. But wait. Haven’t there been all kinds of people who truly wanted to find God and see clearly and never did? There have been plenty of people who wanted to show God they could find Him or show God they could see clearly, but there have been few who wanted God to show them. This takes an openhanded acceptance and submission, something that most people simply aren’t willing to do. When Christians submit before Jesus and read God’s Word, incredible things happen. Scripture is central in the believer’s life. Resolutions are nailed to doors. The most vulnerable of people hear God’s Word and experience His love. Seas of people cry out to Jesus. And when Christians close their hands and revert back to using their own reasoning, the beliefs of culture over the beliefs of God’s holy Word. . bad things always happen. Christians say things that aren’t true, behave inconsistent with their faith, inadvertently reject people hungry for Truth, and turn crowds away from the Gospel. We all see through a glass darkly. I see through a glass darkly. But, praise Jesus, I don’t have to rely on what I see through my fallen nature and reasoning. I can rely on what I see through His Spirit in His Word. A friend of mine has a pet rabbit. I love, love, love rabbits. So I was eager to hold this rabbit in my arms and give him a chance to breathe free from his cage. All his life, I guess, he has lived in a cage that’s probably about three feet wide by two feet tall. There is no way he can do much jumping or any real running. He shares his small space with a food dish and a habitat hideaway that’s knocked over. I guess he doesn’t think he needs to hide. There’s nothing to hide from in his two-foot-by-three-foot cage. And besides, the little fake cove could never hide him from view. It’s more like a cute hideaway for people to admire than for an animal to actually enjoy. It’s not really any rest from prying eyes. He has plenty of food, though–all the food he could ever want. And it’s all right there on the ground for him to pick out. It’s the same ground he has to poop on, of course, but he’s gotten well used to that. I thought that I could make a bit of difference in his life by taking him out of the cage, if only for a few minutes. I thought he’d like to see what life was like on the outside. I thought he’d want to be free. I turned out to be wrong about that, and I have a rabbit-sized scratch on my hand to prove it. He became frantic when I tried to carry him through the latch door. He wouldn’t let me catch him and he made frightened squeaking noises. I tried to befriend him. I pet him. I loved on him. I hoped this would coax him out. I even waited, with the door open, for him to decide he might want to take a peek at the outside world. It was a no go. Finally, I tried one last effort to carry him through the door. When he got right to the threshold of the door, when his very face was sticking out right into the wonderful outside world of freedom, he thrashed with absolute willful determination, hit his head on the bar (but did not really hurt himself), and threw himself backwards away from the open door. I did not bother him with trying to go back outside after that. It was clear he had made his choice. But I felt very sad for him. And I thought about all the years he would probably spend eating off the cage floor, lethargically rabbitting his way from one side of the cage to the other . . . until he eventually passed away, frozen and immobile, inside a cage that no longer needed to restrain him from anything. Satan had us in a cage. All of us. And then Christ did something impossible. Through His blood–the blood of God–He opened the door. Now Satan is pulling his greatest trick of all. Convincing people to stay inside when the door is wide open. I hope he doesn’t win his game with you. We have a profound responsibility of freedom. Christ has given us the choice: He can lift us out of Hell, or we can scratch Him and kick frantically and stay right where we are. The question isn’t whether or not He’ll rescue us. The question is, will we let Him? As I let myself be vulnerable to that rabbit–letting it scratch me when I could so easily have killed it– God allows Himself to be vulnerable to us. He allows us to reject His rescue. What kind of rescue would it be to bring a terrified and angry rabbit to a freedom it wanted no part of? And what kind of rescue would it be to drag a person out of Hell and into Heaven to spend eternity with a God (s)he is terrified of and hates? This life is God’s waiting time, God’s “vulnerable” time. And this life is either our rescue time, or our rejecting time. –And Satan knows all this. No matter how dark, or how barbed, or how padlocked we think our cage is, Jesus has burst open the door. And God is reaching into our cage. by being holy and honorable as long as we live. “You, child, will be called a prophet of the Most High. You will go ahead of the Lord to prepare his way. You will make his people know that they can be saved through the forgiveness of their sins. A new day will dawn on us from above because our God is loving and merciful. Somehow the grave has captured me . . .
See Dan Steven’s video, “The Cell”. Tags: caged, Does God really care about me?, fear of being caged, fear of being trapped, fear of being tricked, God's rescue, Is salvation really a free gift?, living in a cage, rabbits, set free, the reason why you shouldn't commit suicide, waiting to be rescued, What does Jesus offer?, What is God like?, Who is Jesus? Genesis 1 is the story of God’s homeruns. Every time God is up to bat, He creates ex nihlo (out of nothing), and what He creates is very good. The crowd is almost too shocked to keep cheering. Surely there must be a catch somewhere. Surely there is something that God cannot do. Don’t all stories have a problem? What problem will God have to overcome? And yet, there is nothing in Genesis 1 that would bring us to conclude God has any sort of problem at all, or that He needs any sort of problem at all. His creative processes are so marvelous that they need no mistake to make them exciting. In fact, any such error from God would ruin His perfect inning, prohibiting the perfect creation that we find our hearts so longing for. Will God actually succeed? Will He be able to smash homeruns on every single pitch? The unquestionable answer Genesis 1 leaves us with is yes. Yes, God will get homeruns every single time. Usually, we long for variety in a game, but we find ourselves here (as our hearts fall in love with a God who acknowledges us on His first time up to bat–waves to us even! ), filling with deeper and deeper joy each time the ball flies out of the stadium. There is something deeply personal about God’s homeruns, and we intuitively know He is doing this for us. We have the astonishing inkling, so uncanny we’re almost sure it can’t be true, that we are actually going to find ourselves stepping up to the mound very soon. But why? Why would God share His field with us? As Genesis 1 unfolds, He proves time and time again that He can do everything well–alone. Why would He want us? Could it be that God delights in giving away adventure, creativity, and the choice and power to love . . . as free gifts . . . because His very nature is to be good? He has hit the biggest homerun of the inning. Tags: baseball analogy, Bible, Can God be trusted?, Does God love me?, Does God love us?, free will, Genesis 1, Is God good?, Where does creativity come from? In the very same sentence that God tells us He created a universe we cannot wrap out minds around, He tells us He created our tiny earth! That is the kind of God we have! He pays attention to us! He uses one word to sum up the entire marvels of the universe: heavens. And then He chooses to tell us one itty-bitty place within that universe He made: the earth!!!!!! But it’s not just that He made the earth. In this verse, the very first verse of the Word of God, God tells us He made the Heavens, and, separate from that, He made the earth! And, just as the crowd goes wild when the first pitch results in the first homerun of the night for the home team, our hearts should go wild for the first verse of Genesis 1:1. Our souls should be on their feet, applauding frantically, as we witness the first sign of God’s love for us in the very first verse He says. God didn’t just get lucky at bat, either. We have the profound feeling that God has planned out the whole game and, as He takes His first victory lap around the bases, we will see more runs to come. Tags: baseball analogy, Does God care about me?, Does God care?, Does God love me?, homerun, What is God like? I awake inside a kitchen oven. I am not sure that I can say I was born in this oven, as it may have been long before that when I began. I can’t remember back to when I was water, flour, eggs, milk, baking soda, cinnamon, brown sugar, nutmeg, molasses, cloves and, of course, ginger. I’m uncertain whether I was alive or not when I wasn’t a complete being. I don’t remember those days when I was “many”. Maybe the truth is that I wasn’t born until these ordinary ingredients were stirred together and forced to fuse. Or perhaps it was when I was given a shape–of a gingerbread being– that I had my first breath. Or it could have been the oven’s heat the brought me to life. Whatever got me here, I know only that I am alive now and I want to get out. The timer is set, I hope, for just the right time, as I am paralyzed, my melted self stuck to this pan, utterly helpless to save myself in any way. I don’t want you to think this is painful; it isn’t. The heat makes me feel as though I have swallowed the sun, but it is not blistering or unkind. I do in fact treasure the warmth that bubbles in me, because I know it is this very heat that will eventually harden me, make me into who I will be for the entire course of my life. I wonder what is outside this oven. I wonder why I was made, what purpose I will have, what meaning there is to my life. I hope my life is something spectacular. I hope, even, it is everlasting. I wonder if I might be the most important thing in this world and if perhaps everyone is waiting for me to come out fully formed and beautiful so they can serve me. I have found out that I am nothing more than a cookie. I came out of this oven minutes ago with my eight brothers and sisters–to learn we have no job at all. We are to lie on this pan until we cool, and then we are to be eaten. Imagine! I was born to die. How can I believe this when I know there is something . . special . . about me. I can’t move much yet, but I am trying very hard. I have to struggle with every spice in my body to peel the tip of my toe or the tip of my head off the pan. I am working and working to be free. My dream is to get myself unstuck from this pan, so that I can run away and find something somewhere that is a better life purpose that being eaten alive. I never thought I would get myself unstuck from that pan. If it weren’t for the cooking grease rubbed like sunscreen under my back, I have been gotten loose. But now that I am unstuck, I am hardly sure what to do. I am quite cool and I feel strangely stiff. I want to go back to the oven. I don’t want to think about what is so very wrong with me. I look from myself to my brothers and sisters. None of them talk or move. None of them answer me. But their brown skin is smooth and flawless, as a cookie’s should be. I have a horrible scar of pinched, ugly lines on my chest. I cannot for all my reasoning imagine what could have happened. The only thing I can figure is that someone didn’t pay close enough attention when they pressed the cookie cutter down on top of me, and dragged something right through my chest. At least it is only one spot. I hear the hustle and bustle of happiness from somewhere outside the kitchen, but I know this happiness is an anticipation of my demise. I mean to say that there are beings who will actually be happy to eat me. I don’t know how I feel about being dressed to be eaten. The beings who now dress me don’t know that I have already unstuck myself from the pan, or that I am alive at all, as I froze when they walked in and pretended to be as unknowing as my brothers and sisters. I have seen myself in the silver reflection of the alluminum foil, and I am very beautiful. My icing is lovely. I have a red shirt with white lace. I have a green skirt with white trim. I have candy buttons that are nothing short of wonderful. I already had indentations for my eyes, nose, and mouth from the cookie cutter, but my eyes have now been filled in with black frosting and my mouth outlined in red. I had a candy nose and my red licorice hair is jeweled in sprinkles. I have little green shoes with tiny licorice shoe laces and white frosting socks lined with red trim. The best news of all is that the ugly swirling lines on my chest were covered with extra icing in the form of a gaudy shirt pocket. I am proud no one can see my scar now. I must admit, I do look like something that is meant to be chewed up and digested. Maybe I should not fear my fate, but embrace it instead. After all, this is a very popular way to go: bedecked and at the height of youth and beauty, vanishing in a few moments time. I will be loved, I think, through my destruction. And I know I will never go in the trash. I won’t be left out, stale, until I am an old cookie. No, I am sure I will be crumbled between teeth in no time. I only wonder if this is really what I want. While I was laying here, thinking of what to do, a humongous being came in the room and use a spatula to scrape my nearest brother off the pan. I watched as the being shoveled that brother, along with three of my other siblings, onto a plate. The horrible creature then picked up my brother and bit his head off. There was an awful crunching sound. I can’t describe the way it reverberated through my being. I am convinced that this world I have been brought into is no good at all. I wish I had never left the oven. I wish I had been burned to a crisp there. What good is there in my life? I am to be eaten, and that is all. There is no adventure of me. There is no hope for me. There is not even any love for me. The only purpose I serve is to disappear, and then another batch of my species will be created. On top of all this, the loneliness of the situation is overbearing. None of my brothers or sisters will talk to me. None of them seem to be alive as I am. None of them act as though they feel excitement or terror or pain. It is me and me only who seems to have been given emotions, thoughts, dreams. I wonder why it should be me who has this curse. I only live to die. What possible reason could there be for me to wake out of nonexistence into this existence, only to disappear back into nonexistence? It has occurred to me I might run. I don’t know if this would be a good thing or a bad thing. If I fall off the countertop, I might break into crumbs. If I am caught, these villains who baked me might break me into pieces for punishment. If I leave this kitchen, I might find out the rest of the world is worse. I might end up wishing I would have died here. At least I know what is going to happen to me if I stay here. It is not the worst fate in the world to have your head bitten off. But it isn’t the best, either. And that keeps me wondering. If I shouldn’t try to run. I did not know that if I began to run, I would never be able to stop. The instant I stood on my feet, the pan made the softest plinking nois. That was enough. From all over the house I heard screams of rage, and that began the run for my life. Before this, I was just lie in a pan all day, thinking over my choices—and over. But now that I have chosen to run, I am an enemy against my lot in life. I am defying destiny, I think. I am running and running and running and the very ones who made me, who gave me all the beauty and love I have ever known, are chasing and chasing and chasing. I have two choices: give up or keep running. I have to use my gingerbread legs to run as fast as I can. I cannot think about anything besides running, or I will not be able to run anymore. A gingerbread cookie is not made for running. It is made for eating. I am afraid my legs will break off at any second. This has become a marathon of the will—my will. No one helps me. Everyone is against me. I wonder how long this can possibly go on. Nothing is made for gingerbread. Mixing bowls, pans, stoves, spatulas—these are made for those who want to eat us, not to love us into being. And everything else in the world is impossible for a gingerbread to understand or be helped by. I never should have started running. I have come to learn about all that is not made for gingerbread. The first thing was the most frightening: the kitchen window. The light from the outside world blinded me the closer I got, and then when I got close I saw me in its reflection: a batch of crumbs slathered with icing that look very ugly to me now. The window was only open a crack. I fell on my back and slid under, afraid the terrible foxes chasing me would slap the window down on me halfway through. That has to be worse than getting your head bitten off, and if I could have gone back and laid back down on that pan to have my head bitten off, I would have. I don’t know what made me go through that window. Maybe the stress of the chase. Maybe the hope I think I still have that there is a reason to live and not die. I threw myself in a slide, and the biggest baker slammed the window closed as hard as he could. I saw it all coming. The slam. The snap of my body in two uneven pieces, one side flying out the window, the other stuck on the sill. And the end. The end of me, and everything I knew about myself, and whatever I hoped I was going to find outside. I don’t know what did happen. It all happened so fast. But even as I saw the baker looming over me, eyes shining in anger, yanking the window down as fast and as hard as possible . . . I felt like something had my foot. I was doomed. There was no way I could slide under the window before even my arms were through. My head didn’t have a chance. I saw the sill coming down, and I felt it, even, touch my wrists and waist. I knew it was all over. It was all over. Something had my foot. I knew there couldn’t have been something that had my foot, but I know something that my foot. I flew through that window like toast out of a toaster, only faster. Faster than if I had been thrown by springs. I slid through faster than the baker could slap down, and before I could understand how, I found myself sliding away from a closed window. The baker had meant to break me, but instead had shut himself off from me! The window now closed, I was sure all my problems had been left behind. I was too stunned to feel any pain from my foot or even any terror in the plunge to the flower box. I thought the landing would break me into crumbs, but it was me who did the breaking. I snapped a perfect red rose in two. I rolled myself off the flower box, because the window was open agai. An arm lunged out to grab me. I fell to the grass. I thought I had escaped everything. I thought I had made it through. And then I felt the wet on the grass and I knew I had done everything for nothing. I will turn to mush. I will turn to mush, and I am ruined. My icing so smeared I had to wipe it away from my eyes. I can see better, but who cares about that? I am no longer beautiful. I am soggy. This is not how I imagined the world. I hear the door slam to the house and I know they’re coming after me. The whole world will wake up and start chasing me, I’m sure. And I wish I had never started running. No one cares about me. No one cares that as I run through the grass, blobs of my icing, blobs of who I am, the very thing about myself I am proudest—stick to green blades. Already rats are with me. I think they mean to nibble me down to nothing, but for now they are happy to follow behind me and lick the icing off the grass. And behind them, close, close behind them, are the bakers. This is worse, worse than I could ever have imagined. I wish I’d stabbed my own heart with a knife back when I was on the counter top. I wish I’d burnt black and senseless in the oven. I wish I could have had my head bitten off, and not my brother. I envy my brother, my brother I felt sorry for. He was lucky enough to be gobbled in bliss before he got to know this world. Everything here is just as awful as the last thing or even worse. There is no end to the bakers. They keep pouring out of their houses, taking up the chase. There is no end to the rats. It’s like they just double as they’re running. And the grass is wet. And everything wants to catch me, from the tiny cricket I stumble on to the oak trees that force me to run around their greedy trunks. I have to be lost, but it is a worse lost than just not knowing where you are. I don’t know where I want to go. I don’t even know where a gingerbread can go. I don’t know if there is anything out here that will prove to be anything better than the miserable experiences I have already had. I don’t know if I should keep going or give myself up and hope someone bites off my head. The beings who chase me have begun yelling rhymes at me. They mock me and they tease me. It makes me very tired. They know they can catch me. I know they can catch me. I try to tell myself to just give up. All around me everyone is out to get me. Everyone is trying to trap me in one way or another. With all the gingerbread cookies that have been made, I wonder why they are so bent on catching me. Why don’t they just bake another batch of lifeless cookies to eat? Or is it that, every second I stay alive, I prove that we gingerbread can have life? Are they afraid other gingerbread will unpeel themselves from the pan if they learn of me? If I run, am I maybe running for more than myself? I have run and run for so long that I am afraid I will end up back where I started. I still have found no reason to run. There is bad news and there is worse news. The bad news is that I fell today on a tin can and a big chunk of my left foot came off. The worse news is nearly all my icing is gone and everyone can see the ugly scar on my chest. I doubt very much anyone would like to eat me now. I think they want only to crush me under their feet, to smear me into the bits I probably deserve for letting myself think this up. I fantasize now about going back to that pan. About being young, beautiful, and whole again. On my runs, I have come across a great many gingerbread billboards, the gingerbread in their rightful places: on display on trays. I realize now that the only loveliness I ever had was in my edibility. I was only meant to satisfy an appetite. I have ruined the one purpose I had. I run now because I despair, not because I hope. There is nothing left for me anywhere. I am crumbling from the inside out and from the outside in. The beings who chase me talk to me all the time now, and, when they’re not insulting me, they go on and on about how beautiful I was before I slid out the window. About what a good dessert I would have made. All my brothers and sisters are long gone. There is only me left. I can’t help but think how ashamed of me they would be if they could see me now. But then, they weren’t alive. Or were they? How would I know, anyway? I pretended to be dead. Maybe they did, too. Did my brother really know what was happening when the baker bit his head off? Was he so loyal to his “place” in life as a cookie that he didn’t for one second let on that he was very much alive? I wonder if there is anything after being swallowed up. Do the crumbs come back together in the stomach and make life again? I doubt it. I think that once you are used up there is no going back. I wonder why I had to be born as a cookie. I don’t even get the honor of being a whole batch. There’s just one of me. I am just me. I am sure that my life began when I was separated from the rest of the dough, shaped by a cookie cutter into who I am today. . . or who I was before I destroyed myself with all this running. I have thoughts I cannot get out of my head about how much I hate myself. I have no right to be in this world outside of the kitchen. I don’t belong here. I have outlived my time. All my glory is gone. I will never make it on a gingerbread cookie billboard. I will never win a blue ribbon for my taste. I have failed as a cookie, and now I see I can be nothing else. But now I cannot be immortalized on display; I cannot even disappear down someone’s throat. The only thing that I have is me, what little there is left. The only thing I have left is the time to dissolve slowly and painfully on a long run to nowhere. I wish I had never been baked. I wish my batter had spoiled. I wish there was no such thing as a gingerbread cookie. I wish I could stop running. I am quite sure this is the last chapter of my life. I have come to the edge of everything I know. I stand at the edge of a river, and there is no longer anywhere to run. Behind me, a mob of angry, ravenous bakers chase me with knives and forks and spoons, and I can only imagine what they are going to do to me when they catch me. In front of me, a river rages that, should I step into it, will tortuously dissolve me into a bloated, dead cookie. I wonder if I will stay conscious through that. Will I even die at all. I wonder if I will be fated to live all eternity as soggy crumbs in a raging river. Will I even die at all. Even if this mob would eat me, I wonder if I would really die. Or would I simply lie as waste among waste forever and ever? What I do know is I am alive now. I know what is alive is. What I don’t know is what is dead. They know I know what they really offer: my instant vanishing from this world I don’t belong in. They are tempting me with death. Should I jump on the back of the nearest fox, so he can convince me to walk up his back as he wades into deeper and deeper water, only to find myself cornered on his nose in the middle of the river? I can’t see any better choice, but if this is really what I want, why didn’t I just let the window sill slam on me before I went through all this? But then, I don’t think I really got myself out of that window. That was . . . something else. Luck or something. I don’t know. I know it wasn’t me. I need something like that to happen again. But is it really wise to wait on luck? This fox snapping up would be the easiest death I could have now. Why am I even thinking about life? That’s not open to me anymore. I’ve gone past my time, now it’s time to give up and pick the ending that’s best for me. A fox—that’s the way to go. Not slow or scary like the river. Not slow or scary like the angry bakers. The fox wouldn’t hurt me. One snap and it would all be over. It wouldn’t even hurt, I bet. Like a mousetrap snapping down on a mouse, all my pain and longing and all my loneliness would be over in an instant, right? Right? How can I know what is going to happen to me past the point I’ve never been? And if I do go past the point, even though I’ll know, I’ll never be able to come back. Or is there something I need to know about before I cross over? The river is before me. The choice has to be made. The red fox knows that I know what he is up to, as he talks of all the great things we will see and do together on the other side of the river. He promises friendship, as if that’s possible between a real, live creature and a plain old cookie. I know just exactly what his motives are. But I find myself almost believing that he would be my best friend forever, just so I don’t have to think about the abyss of separation between myself and real life. I have talked to him at length and he has convinced me that gingerbread cookies are not made to be alive, and never should be. He has convinced me that he will give me sleep like no other, that I can find peace in his bristly fur and live in that peace for all my days. I know “all my days” would be mere minutes if I should ferry on him; but I can’t help thinking that Red Fox might love me most even in this betrayal of me. After all, he would give me such a quick passing from this world, something non one else now offers. He is very fond of me, and I think he even means this trip for my best. There is something quiet in death. Something that calls me from this wildly disappointing existence into total anonymity, obscurity. A union with randomness; a bond with nothing. I can almost not wait to go. How do I start this out? What would you think if you were me, and just as you are about to be rocked to sleep in the cradle of death, you hear the voice of a gingerbread cookie calling from the middle of a candy cane bridge? What in all the world makes sense of that? I know it is nonsense. I know it is make-believe. I know it can’t be real. But in front of the bakers, in front of the foxes, in front of the river, just as I had agreed to take a ride on the fox’s back, and just as my last gumdrop button fell off, a gingerbread cookie yells to me from the middle of a candy cane bridge. I don’t have the itty, bittiest clue what this is about, but I am very sure I have never heard of a candy cane bridge before. Does that mean it can’t exist, or does it mean I have been so busy staring at foxes and bakers and the river and my poor shabby self that I’ve missed out on the one thing I should have seen all along? I don’t get it, but this is wrecking my death plans. I’m not sure how I feel about that. I have gotten myself into the suicidal mood and I’m not sure I want to hear about a candy cane bridge. That doesn’t make sense, anyway. No one builds a candy cane bridge in the real world. That’s like something out of a fairy tale, and I’m not in a fairy tale. I’m in a world where cookies don’t jump off of pans and run away. I’m in a world where the only important thing about me is how I look on a plate and how I fill the stomach. I’m in a world where I’m just a plain old stupid cookie. But here is this . . this gingerbread cookie who, like myself, is fully conscious and, like myself, very gross looking. Her right arm is in the same shape as my left leg. The cookie even has the same ugly scar on her chest! But this weirdo cookie doesn’t share my fatalistic thinking. She thinks she’s found something she needs to tell me . . . and I kinda want to hear it. And I kinda don’t. Now I know, though. There are other cookies like me. Should I really go across a candy cane bridge, or should I realize there’s no way there’s any such thing? I could be beautifully tragic and let the bakers who made me eat me, or the river take me, or the fox snap me up? What is over there, anyway? I don’t know what made me run to this candy cane bridge, but I am sure it is a big mistake. The river roars at me, the bakers curse me, the rats squeak at me, the foxes scowl at me, and even Red Fox has deserted me, tail down, and not looking just too awfully happy with me. I don’t know about this candy cane bridge. I don’t know if it can hold my weight. I’m more scared of landing in the river than I am of any other kind of death . . except . . .
And I’m afraid if I’m swallowed up I will somehow miss being here. “Over here!” the gingerbread cookie shouts, and now I see it’s not just her on the bridge. There is a line of cookies behind her, all cheering for me. I don’t know who in the world they are. They are not my brothers and sisters. I don’t have the slightest idea why they are harassing me with encouragement. I suppose I could go a few more toddles down this bridge, but I am not going to run anymore. I am way too tired. I can always go back if I want. I know, because I took a few steps backwards to make sure. It’s much easier, actually, to walk backwards than forwards, and I have given it a great deal of thought. I don’t know what happened, but when I got about halfway across the bridge, I realized something. I am really on a candy cane bridge. I am really rooted for by batches and batches of gingerbread cookies who shout and grin and cheer and wave. And this is by far not the strangest thing of all. The further I go across this bridge, the more wild everything becomes in my brain, the more opposite to how I knew it before. I can see the shore of the land across the river now, and it is unreal in every way. I have told this to the gingerbread cookies who are all around me now, but they say I only think this because I don’t know what real is. But . . . they are the first beings I have ever known who don’t want to eat me. And so I kinda want to hear what they have to say. The sand is sugar crystals. I’m afraid, I’m really afraid to write this. I think you’ll think I’ve really lost it, and you’ll give up reading. But I’m telling you—I mean it—it’s true: this land I think—I mean, I really think, I mean, I’m almost sure—is a gingerbread land! But that’s not the really crazy thing. That’s crazy, all right, but that’s just the beginning of the crazy. The gingerbread cookies tell me I am Gingy. They tell me this is my name! Could that really be true? I don’t know. But even that’s just a gumdrop in a cookie jar compared to what I’m going to tell you next. I’m afraid this will unravel into an empty dream. I’m so afraid, I almost don’t want to go on. These cookies tell me—they insist to me—that I was not made to be eaten and that, I wasn’t even made by those horrible bakers who tried to eat me at all! They tell me I was placed in that oven by someone known at the Baker, and that he has always wanted me to come to this land! That he doesn’t care about my lost decorations because that was all chemical dye and high fructose corn syrup anyway. That he baked this gingerbread land out of only the real. But that’s not all. The craziest of all the things these cookies have told me so far is that the Baker made me to be eternal! That he doesn’t want me to be the soggy, crumbling thing I am. That he doesn’t want me as only a display piece or dessert. Do you know what they tell me? They tell me he likes to watch his cookies play in the gingerbread land he made for them! Can you believe this? Really? But craziest of all, the cookies tell me that I got up from that pan because he opened the oven door while I was still baking and worked a tiny candy heart into my dough. They tell me that he closed the dough back over my new heart with his thumb and that is why I have the strange lines that I do on the right side of my chest! Those lines are not an ugly scar at all. They are his thumbprint on me! Can I really believe this? Or do I go back to foxes and forks? The Baker made this bridge for me to cross. And on the other side is the most wonderful place I have ever known, and I can see it with my own unfrosted eyes. And in the middle is a gingerbread house. I don’t feel worthless anymore. Do you know the Baker made this house for me? For us? 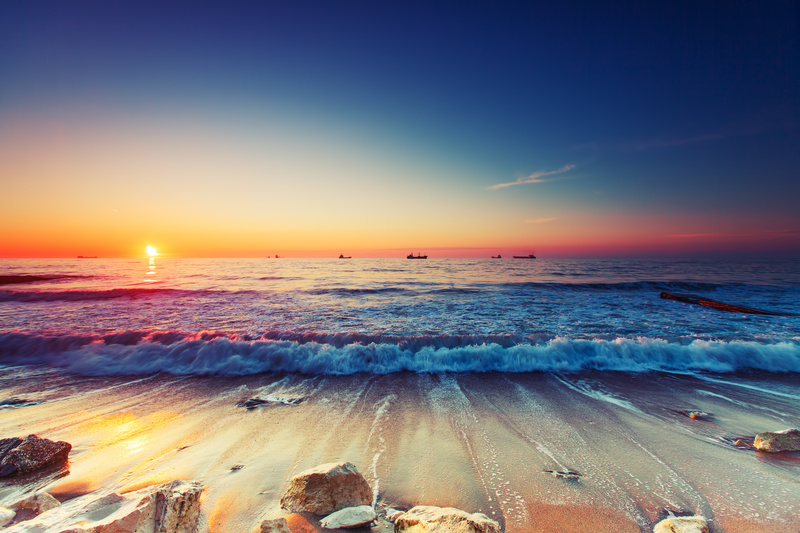 I just want to be here. I have never been able to smile my whole life. It was impossible because my mouth was frosted in a straight line. I thought that was the way mouths were meant to be, even though it covered up my original one, the one the Baker made. That was a curve. Today the Baker used red icing and he made a mouth that curves up. But this icing isn’t like the icing I had. The icing I had before was like, well, it was like icing all over my face. But this icing becomes a part of me. I can actually smile with my smile. 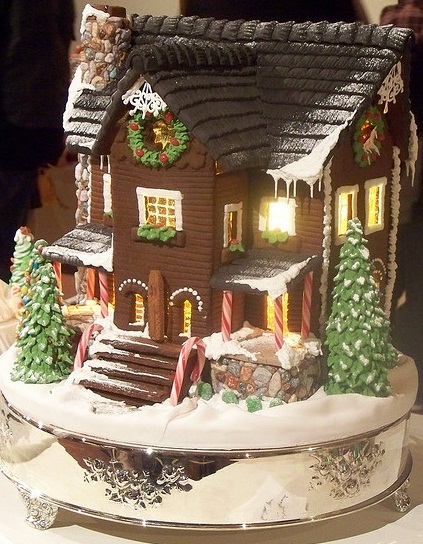 I don’t have my left foot back or new decorations, because I’m not supposed to go inside the gingerbread house yet. I have more than just a name. I have a job. I get to stand on the bridge to be on the lookout for other gingerbread cookies who don’t know about the candy cane bridge or the gingerbread house or even the Baker. “Why did it take me 26 years to get here? And more importantly, how did I ever find this place?” I ask the Sunbathers, not aiming my question at anyone in particular. “It’s always been here,” one answers. “It has? But . . no. It just couldn’t be. See, I’ve been looking for this place my whole life. All my will’s been bent on it . . well, I mean, I did get sidetracked a little. A lot. Most of the time. Nearly all of the time. But this was the place I really wanted to find. Really, in my heart of hearts. This is where I’ve been wanting to go. So, you see, it couldn’t always have been here,” I explain. “Because I was just over there.” I point to the shore across the dried-up ocean floor. “See there? See where all those people are stumbling around, plotting against each other and snarling? That was where I was, see. I’m suddenly convinced that they have been seeing me, all this time. But it’s almost beyond belief. “But- you- if- . .” Sentence fragments are flying all over the place, the confusion blowing them everywhere, and any pieces I happen to find don’t fit with any others. I can’t make a sentence to save my life. Of course, I don’t have to save my life. That’s the whole point of this place. “You had a real obsession with waves,” another Sunbather agrees. “None of that was necessary,” I say in shock, knowing it’s true. “None of it,” one of the Sunbathers agrees. “No one would have, no one except the Great Swimmer. The Great Swimmer changed all that years ago,” a Sunbather explains, even though he knows my learning and accepting of that truth was how I finally got here. “Are you sad about that?” one of the Sunbathers asked. “Oh yes,” I say. “Oh yes.” I sit down on the hot, hot sand in the hot, hot sun. I have almost forgotten what it was like to be cold, even though it was just a minute ago that I was. A minute ago or was it really almost 2,000 years ago, with the death of Christ? “You look like you could use a rest,” a Sunbather says. I cough up a spurt of saltwater, and I feel really good doing that. “I don’t have to go into any more oceans,” I say in relief. I keep coughing up nasty, burny water. It feels good to get rid of it. It feels even better knowing I won’t have to swallow any more down. I start to lay down. I have never laid down before. I have never been able to close my eyes for more than a blink. I have always been vigilant. I have always been trying to make it across oceans. I have always been drowning. “Whoa. Cool.” I know that really isn’t the right thing to say, or the most intelligent, but it’s the only thing I can think of. “So . . where do I go? Which ocean? There must be thousands.” I know, because I used to be drowning. I used to be drowning for a long time. “Millions,” one of the Sunbathers correct. “Which one, then?” I ask. I want to write it down on my To-Do list. My great big To-Do list that used to be filled with names of oceans I commanded myself to drown in. But when I reach for my list, I notice it’s gone. “What?” one of the sunbathers asks. “Oh, your To-Do list?” She chuckles. “This isn’t funny!” I cry frantically. “Everything I was supposed to do was on it!” I start to get that sick feeling in my stomach, that sick feeling I get when I can’t even check off one of the bazillions of things I’m supposed to be doing on my ever-growing list. But then, the panic stops. I take a deep breath. I laugh. Of course it is. I know that by now. “HE DID EVERYTHING ON MY LIST!” I cry, pure, sweet peace. “HE DID EVERYTHING ON MY LIST!” My heart rolls around in the rapture of living without a list. “NO MORE LIST!” I scream hysterically, flopping down into the sand. “NO MORE LIST!” I roll around in the sand, laughing and laughing. I am a lunatic, a lunatic for the Great Swimmer, and I want to stay that way forever and ever. I take a little nap. It’s my first time sleeping. (It’s hard to sleep when you’re drowning.) When I wake up, I’m still on the shore. “But I can’t drown now,” I say, ecstatic. “Look, see?” I hold up my arms. “I’ve got these wonderful floaties on my arms that the Great Swimmer gave me. And you know what’s even better? I can’t get them off.” I realize now how stupid that sounds. “I mean . . I tried,” I admit. They all just lay there smiling, waiting for me to get it. “There you go,” a Sunbather says. “Now you’ve got it,” another Sunbather says. “I’m so happy!” I say. “It’s about time,” one of them says, grinning. “Now you’re talking,” a Sunbather encourages. I look down at myself. I have little floaties on my arms. My body is awfully wrinkled from spending so much time in the ocean. I can still see the oceans I used to drown in. They look awfully dark and scary. I might mess up if I go back there. I might thrash around in the water and snort up saltwater. I won’t drown, of course, thanks to my floaties. But I might make a real fool of myself. In fact, I probably will. I wrote this metaphor April 19, 2009, two days after my conversion. The original title was “Freedom is Free (For Us)”.